This is a unique opportunity, challenge and responsibility for all of us. This potentially game changing forum will bring together the entirety of the international solidarity movement and allow us to show our strength, celebrate our successes and plan for more. We're very excited about the opportunities it presents for the solidarity movement in general and for the BDS movement in particular. The BNC's call can be read in full below. Please share widely!!! Occupied Palestine is part of every free heartbeat in this world and her cause continues to inspire solidarity across the globe. 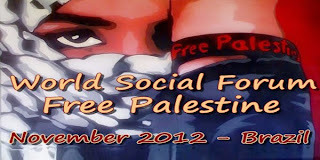 The World Social Forum Free Palestine is an expression of the human instinct to unite for justice and freedom and an echo of the World Social Forum’s opposition to neo-liberal hegemony, colonialism, and racism through struggles for social, political and economic alternatives to promote justice, equality, and the sovereignty of peoples. 1. Show the strength of solidarity with the calls of the Palestinian people and the diversity of initiatives and actions aimed at promoting justice and peace in the region. c) Implementing, protecting, and promoting the rights of Palestinian refugees to return to their homes and properties as stipulated in UN resolution 194. 3. Be a space for discussion, exchange of ideas, strategizing, and planning in order to improve the structure of solidarity. Exactly sixty-five years after Brazil presided over the UN General Assembly session that agreed upon the partition of Palestine, Brazil will host a different type of global forum: an historic opportunity for people from all over the world to stand up where governments have failed. The world’s people will come together to discuss new visions and effective actions to contribute to justice and peace in the region. We call on all organizations, movements, networks, and unions across the globe to join the WSF Free Palestine in November 2012 in Porto Alegre. We ask you to join the International Committee for the WSF Free Palestine, we will establish as soon as possible. Participation in this forum will structurally strengthen solidarity with Palestine, promote action to implement Palestinian’s legitimate rights, and hold Israel and its allies accountable to international law. Together we can raise global solidarity with Palestine to a new level.